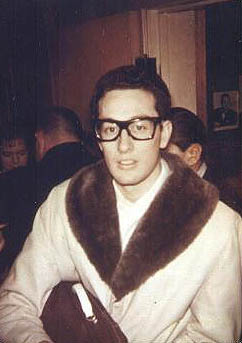 This picture of Buddy Holly taken backstage at the Laramar Ballroom in Fort Dodge, Iowa on January 30, 1959 during the Winter Dance Party tour. He is ready to leave, has on his yellow leather coat with the fur collar, and is holding his overnight bag. Larry Holley went to Clear Lake, Iowa to identify and claim the body of his brother. He went to the crash site and actually picked up this bag which was lying in the snow. He brought it home and kept it under his bed all those years until he gave it to me in 1989. I have only opened this bag twice. The first time was to inspect the contents and list them along with photos for my records. The second time was for the UK Buddy Holly tribute program Without Walls-Not Fade Away that aired in 1996 in England . On that program, you saw me remove some of the contents including a pair of Buddy’s sunglasses in a case. In the original article below from 1989, I held back that information but if you saw the program, you know now. As so many people have asked about the bag and its contents, I’m republishing an article, simply titled "Buddy’s Overnight Bag" that first appeared in Rockin’ 50s issue #16, published in February 1989. Hope you enjoy and that it answers your many questions. 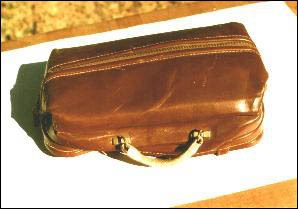 "The last thing Buddy had in his hands was his overnight bag as seen in the photos on this page. This is where Buddy carried his essentials. 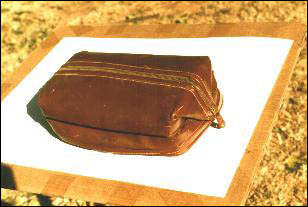 The bag itself is a red-brown leather, measuring about 13" long by 8" wide. The height was about 6", which is a guess as the bottom was torn out during the plane crash. It was in this false bottom that Buddy carried the pistol which was found later that Spring by farmer Albert Juel. "The single handle was taped, probably for comfort in carrying. The bag had one zipper and the steel frame was badly bent. The bag is dirty, never having been cleaned since February 3, 1959. "The contents were what any typical performer of the day probably would have carried. I’ve listed the name brands in case any of you are interested. 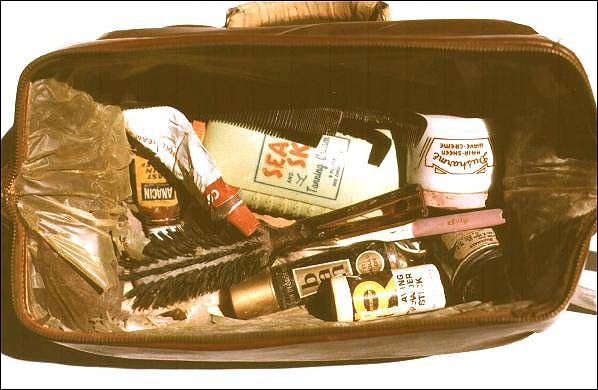 "The bag, belonging to Buddy Holly, contained a roll of adhesive tape (same size as what was used on the taped handle), a toothbrush, a half-used tube of Colgate toothpaste, a hairbrush and a comb (there must have been two combs as a BHMS member was given one of the combs by Larry Holley some time ago), a jar of Dusharme lanolin hair sheen, a Remington shaving powder stick, Sea And Ski tanning cream (8 fluid ounce plastic bottle hardy used), a small bottle of Anacin, a small clothes brush used to remove lint (with much lint on the bristles), a tube of Chapstick lip gloss, a packet of five Ronson lighter flints with two missing (no lighter was found in the bag. A lighter was found at the scene and returned to Jay Richardson. ), a Ban lotion deodorant tube, and a few other assorted items, most in pieces. "I felt very funny while examining this bag. It was the last thing buddy Holly had in his hands. It has not been cleaned since 1959 and the damage to the bag and some of its contents attest to the final seconds and what happened. "An upset and distraught Larry Holley told the man to ‘Get rid of them, burn them, give them away, whatever. I don’t want to see them again’. Of course, Larry Holley now knows that he should have kept them, however, the only thing he did bring back was Buddy’s overnight bag. That’s how the bag made it back to Lubbock."